Over the past four decades, the Parisian museum has revolutionized many things. First the architecture of this type of places, but also the museography and even the approach of contemporary art perceived here as multidisciplinary. In this anniversary year, the Centre Pompidou will still amaze us. When the center of Paris underwent its transformation in the mid-1970s, the area now occupied by the Centre Pompidou reminds us of one of the Parisian neighborhoods of the end of the 19th century: unhealthy buildings, wastelands, street vendors and small trades who are trying to survive. A vision worthy of Zola that the avant-garde architecture of the museum will capsize. Certainly, many ways will rise to denounce these colored tubings that disfigure the traditional Parisian landscape, but which today is astonished? And especially who remembers the President of the Republic, Georges Pompidou, who passionately wanted ” that Paris has a cultural center (…) that is both a museum and a center of creation, where the visual arts would neighbor with music, cinema, books, audiovisual research etc. The museum can only be modern art, since we have the Louvre. Creation, of course, would be modern and evolving unceasingly. The library would attract thousands of readers who would at the same time be brought into contact with the arts. “His will was created and it was the young team of Renzo Piano and Richard Rogers who won the international architectural competition with a very provocative project, now recognized around the world for its architectural boldness and its precursor character. 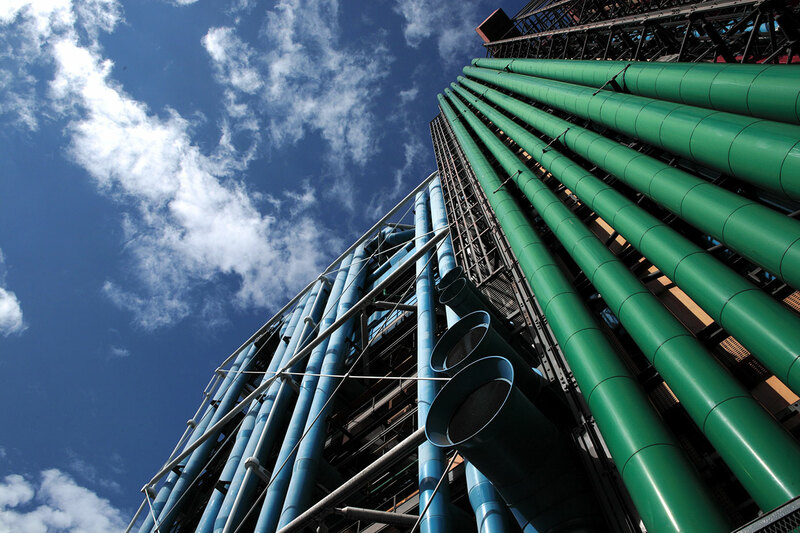 Forty years later, the Center Pompidou is a major cultural player in France and abroad. It brings together in a unique place a collection of more than 100,000 works, a library of public reading, cinemas and shows, a research institute (IRCAM), spaces for educational activities … «The Center Pompidou has built one of the most important collections of modern and contemporary art in the world, presented 325 exhibitions, proposed shows, cycles, debates, festivals … “, said Serge Lasvigne, President of the Centre Pompidou. And to celebrate this anniversary, “the beautiful age when we know how to open up greatly to what happens, to share experience and acquired strength”, the demonstrations are not going to be concentrated within the museum, but to radiate throughout France, “with all the friendly institutions that share our objectives, this French cultural network that is so precious,” insists Serge Lasvigne. Some 50 exhibitions will showcase all the pieces of the collection of the National Museum of Modern Art throughout the year, as well as the live performance. Thus, from Arles to Metz, via Brest, Armentières and Nantes, the Centre Pompidou and its partners will support artists, whether companies already presented or young talents. In Paris, the first major exhibition of this fortieth anniversary will be devoted to Josef Koudelka. La Fabrique d’exils, which will open on 22 February, will present thirty-five of the seventy-five photos given to the Centre Pompidou by the Czech photographer. In 1970, shortly after photographing the invasion of Prague by the Soviet tanks, Josef Koudelka decided to leave the Czech Republic. During the winter months, he lives in London then in Paris. The rest of the time, it is on the roads of Europe to track down the chances. It was during this period of the 1970s and 1980s that Koudelka produced his most enchanted photographs that would compose the Exils series. The exhibition, the first dedicated to the photographer in Paris for thirty years, presents a selection of the most emblematic images of the series, accompanied by numerous unpublished and an extraordinary series of self-portraits created during his travels. It also shows for the first time the notebooks in which the photographer associated his images by formal rapprochement or by themes.